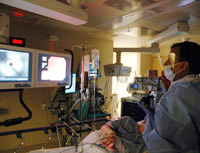 The UCSF Fresno Gastroenterology fellowship program is a three-year ACGME-accredited program. The program matches two PGY-4 fellows each year. The UCSF Fresno Gastroenterology fellowship program participates in the National Resident Matching Program (NRMP). All applications are handled through the Electronic Residency Application Service (ERAS) sponsored by the Association of American Medical Colleges. UCSF Fresno doesn’t generally sponsor H-1B visas, please contact individual programs regarding their policy on H-1B visa sponsorship. UCSF Fresno is committed to selecting and hiring the most capable housestaff in order to pursue its strategic goals of excellence in teaching, learning, research, scholarship, creative activity and service to the community. All offers of appointment to UCSF Fresno sponsored GME programs are specifically conditioned upon a criminal background investigation. Background checks will be carried out by an agency on behalf of UCSF Fresno Graduate Medical Education Office. By signing the background check release form, prospective trainees are consenting to a background investigation. Fully accredited by the Accreditation Council for Graduate Medical Education.